Is trust Jeremy Lin’s secret weapon? I’ve got a confession to make: I’ve caught the Linsanity along with everyone else. It’s only been two weeks, but in that time former Harvard point guard Jeremy Lin has transformed a failed Knicks season into the most compelling storyline in the NBA. And make no mistake, Jeremy Lin is at the very center of this transformation. But what is it about Lin that has transformed the Knicks’ season? An astute statistician might say it is his on-court production: Lin has been scoring, hustling, dealing out assists, navigating the pick-and-roll, and hitting open shots better than any Knick point guard since, well, since I can remember. That is definitely part of the equation. But a single player does not make an effective basketball team. When I watch the Knicks these days, I see something else about Jeremy Lin that makes me believe that his influence goes beyond simple numbers: His teammates trust him. 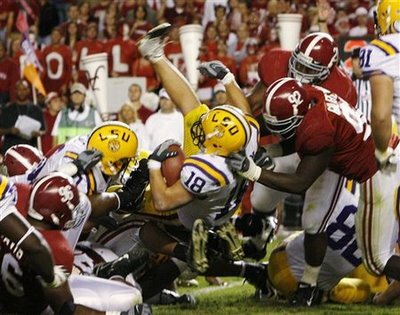 This weekend, college football fans were treated to one of the most highly anticipated football games in the recent history of the sport: #1 LSU vs. #2 Alabama in a battle of the unbeaten juggernauts of college football. As expected, the game was a physical, defense-first battle. A true representation of what has become a southern tradition. How does such a hospitable place also earn a reputation for smash-mouth football? The answer lies in the research of Dov Cohen and his colleagues (1996) on what has been called the Southern Culture of Honor. Cohen observed that the original people who settled in the southern parts of the USA tended to be from herding cultures of the United Kingdom. These herding cultures live in environments where people’s livelihood (e.g., their sheep) are in context motion, and also, under constant threat of theft from others. It is these environmental circumstances, Cohen argued, that make honorable behavior of critical importance.